Click the Tools selection button immediately below the PhotoStage Pro logo to display the Tools controls. These are arranged in five panels, which roughly correspond to all the menus for Lights, Effects and Gazers. The Lights, Effects and Gazer controls on the HUD share the Position and Colour panels. When you click a specific light, effect or gazer, the Position or Colour controls will be assigned to the selected item. The Lights panel allows you to operate all the lights for PhotoStage Pro conveniently. Click one of the number buttons (1 to 6) first to select a light. Click the Create button (white circle) to rez the selected light inworld. Use the Delete button (grey circle covered by a red “x”) to delete the selected light. Use the Show button (white circle with black dot inside) to make the selected light visible. Use the Hide button (grey circle with grey dot inside) to make the selected light invisible. Use the On button (bright green circle) and Off button (dark grey circle) to switch the selected light on or off. Select a light on the Lights panel. The light number will appear on the Colour panel. Use the Colour panel to select a predefined colour or compose a custom one (see Tools: Position & Colour). Use the Warm, Cool and Soft buttons on the Light panel to quickly apply these commonly used colours to the selected light. Select a light on the Lights panel. The light number will appear on the Position panel. Use the Position panel to move the slected light to the position desired (see Tools: Position & Colour). 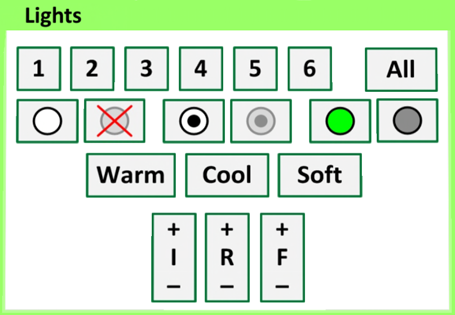 Click the minus and plus icons on the I, R and F buttons to decrease or increase these values (I=Intensity; R=Radius; F=Falloff). Note: You can use the All button to operate on all lights at the same time. Please note that some operations cannot be done on all lights, and you will have to target them one by one. The Effects panel allows you to operate all the effects for PhotoStage Pro conveniently. Click one of the number buttons (1 to 6) first to select an effects generator. Click the Create button (white circle) to rez the selected generator inworld. 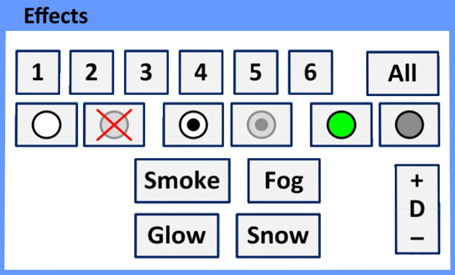 Click the Smoke, Fog, Glow or Snow buttons to select the type of effect desired. Use the Delete button (grey circle covered by a red “x”) to delete the selected generator. Use the Show button (white circle with black dot inside) to make the selected generator visible. Use the Hide button (grey circle with grey dot inside) to make the selected generator invisible. Use the On button (bright green circle) and Off button (dark grey circle) to switch the selected generator on or off. Select an effects generator on the Effects panel. The effects generator number will appear on the Colours panel. Use the Colour panel (bottom of the HUD) to select a predefined colour or compose a custom one (see Tools: Position & Colour). Note: not all effect types support colour changing; for example, snow is always white. Select an effects generator on the Effects panel. The effects generator number will appear on the Position panel. Use the Position panel to move the slected generator to the position desired (see Tools: Position & Colour). Click the minus and plus icons on the D button to decrease or increase this value. Note: You can use the All button to operate on all effect generators at the same time. Please note that some operations cannot be done on all the effects, and you will have to target them one by one. The Gazer panel allows you to operate all the gazers for PhotoStage Pro conveniently. Click one of the number buttons (1 to 6) first to select a gazer. Click the Create button (white circle) to rez the selected gazer inworld. Use the Delete button (grey circle covered by a red “x”) to delete the selected gazer. Use the Show button (white circle with black dot inside) to make the selected gazer visible. Use the Hide button (grey circle with grey dot inside) to make the selected gazer invisible. Select a gazer on the Gazers panel. The gazer number will appear on the Position panel. Use the Position panel to move the slected gazer to the position desired (see Tools: Position & Colour). Note: You can use the All button to operate on all gazers at the same time. Please note that some operations cannot be done on all gazers, and you will have to target them one by one.